Fulham boss Slavisa Jokanovic says he is close to winning his first game since his appointment in December. 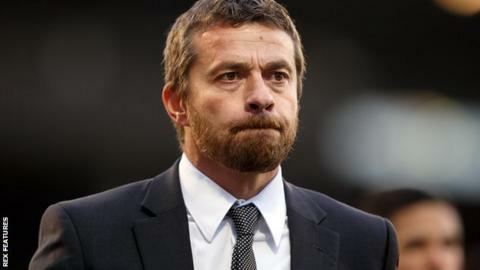 The Whites have lost four of his six games in charge heading into Saturday's west London derby against QPR. "I can speak about time, processes, players and many things but the most important thing is results," the 47-year-old Serb told BBC Radio London. "We are going in the right direction and I believe we have done important things in the days behind us." Fulham have won just one of their last 15 games in the Championship and have slipped from mid-table to 19th, four points above the relegation zone. "My obligation is to try to find a solution to the situations and the only way to do that is by working on the pitch and in the office," added Jokanovic. "I think about football all the time to try to find a solution for my team. We need to keep going and be brave in all situations." Jokanovic will find a familiar face in the opposing dugout at Loftus Road on Saturday (kick-off 12:30 GMT), with former Chelsea team-mate Jimmy Floyd Hasselbaink currently in charge of the R's. Jokanovic says the Dutchman was influential in helping him adapt to life in England when he moved to Stamford Bridge from Deportivo La Coruna in October 2000. "Jimmy was a very important person in my first experiences here in England," he said. "I spoke with him in Spanish as that is my second language. He helped me so much and I have a good friendship with him. "We used to play cards on the bus so I might have a bet with him on the game. "I spoke with him last year when he started coaching in England and he was very excited to have the chance. In a short time he has made important steps."